Here is a light weight and userfriendly mobile app for traders , active investors & jewellers who wants to track markets on the go. 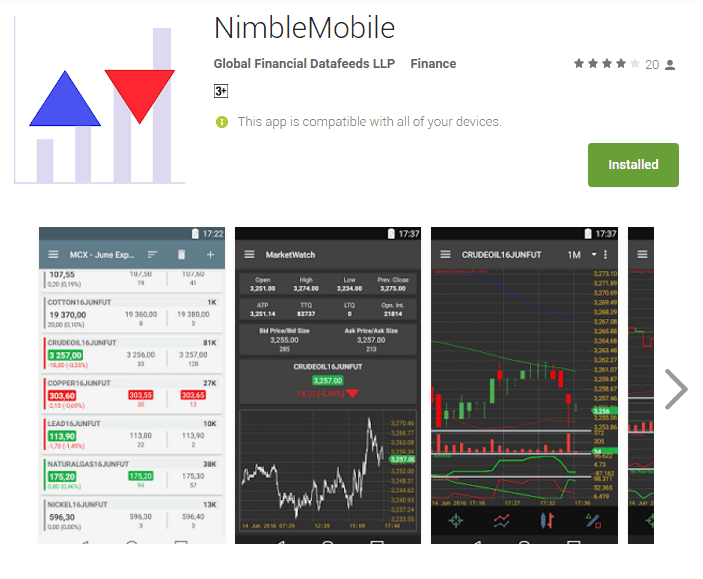 Nimble Mobile App is realtime streaming and charting app for NSE, NSE FNO, NSE Currency & MCX markets from globaldatafeeds (authentic data vendor for NSE, NSE FNO, NSE FX, MCX). Currently app is available for Android and IOS devices. Access is completely free for active Globaldatafeeds users and limited trial is available for non globaldatafeed users. Chart Streaming is really fast and designed to work even with with low bandwidth 2G connectivity. Charting comes with a pre packed 80+ custom indicators and ability to draw studies over the charts. So what are you waiting for ? Download the App now. you can search ‘NimbleMobile’ on Google Play Store and give it a try. Do you have any charges for Equity & MCX realtime data with signals ?